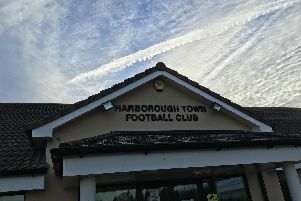 Harborough Town enjoyed their second win of the season in the Future Lions United Counties League Premier Division when they beat Sleaford Town 3-1. It has been a difficult opening to the campaign for the Bees having exited the League Cup, FA Cup and FA Vase while collecting only one league win – a 2-1 success in the derby match with Desborough Town. But they savoured victory over Sleaford despite trailing to a 10th-minute strike from Harry Millard. A first-half double from Aaron Preston put them in front at the break and the points were sealed when subsitute Lewis Jackson’s injury-time goal made the game safe. 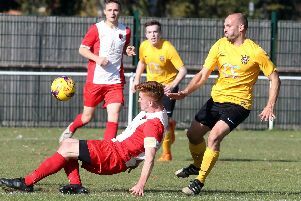 This weekend they will hope to add to their tally when they take on rock-bottom Wellingborough Whitworth. Lutterworth Town had a mixed week. Saturday saw them smash 10 goals past Bourne Town with Tendai Daire bagging a double hat-trick. Justin Peace, Rhys Roberts, Jordan Small and Kyran Taylor added the others. But midweek saw them knocked out of the League Cup as they lost 2-1 at Kirby Muxloe. Next up for them are Sileby Rangers away this weekend. Lutterworth Athletic’s fortunes went the other way. They were beaten 3-2 by Melton Town in UCL Division One, but then bounced back to form by knocking out Oakham United in the Leicestershire & Rutland Senior Cup first round. Sitting fifth in the table, they are back in action this weekend when Rushden & Higham visit Hall Park.